Our bar has been introduced to add to your Olive Tree experience. Whether it be for a pre or after dinner tipple or just popping in for a relaxing drink, we will always be happy to serve you at the Olive Tree bar, where we have a wide range of cocktails, wines, beers and spirits as well as bar bites available from our Tapas Meze menu. 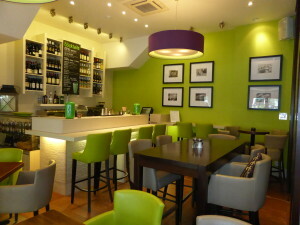 Designed as a more modern, funky space in shades of lime green and purple, this vibrant area is a superb addition to our already successful restaurant. The bar is open to all from 12:00 midday to 12:00 midnight, 7 days a week. Although on Friday and Saturday nights from 7:00 pm the area is reserved for diners eating at the restaurant.